The dream of an undefeated Stage 3 comes to an end for the Boston Uprising, as the New York Excelsior emerge the Stage 3 Champions. The Overwatch League has concluded Stage 3 with Sunday's $125,000 Stage 3 Finals. It came down to the best team in Stage 3 against the best team throughout the whole season. But while the Boston Uprising went into Sunday without a Stage 3 loss, it's the New York Excelsior that come out the Stage 3 Champions. The series came down to Numbani. New York looked to get off to a fast start, but Boston was able to force Overtime before eventually giving up the final point. Boston looked to rebound on offense, but as they threatened to take the last point, Jong-Ryeol "Saebyeolbe" Park went off with clutch Tracer play and led the Excelsior to a 3-0 series victory. The Uprising's offensive onslaught stalled early on, as New York asserted themselves on Route 66. Boston tried to rebound on Nepal and looked to have the last control point in hand. But the Excelsior took over with Boston at 99 percent and ran the table to take the second map and momentarily crush the Uprising's spirits. The third map took both teams to Volskaya, which has belonged to the Uprising for the past several weeks. But Saebyeolbe went nuts to start the third round and wiped out most of the opposing Boston team with Tracer's Pulse Bomb. Tae-hong "Meko" Kim cemented an unstoppable offensive push with D.Va's Self-Destruct to take the second control point. Boston quickly responded, taking their control points efficiently behind Gwon "Striker" Nam-Ju's Tracer and Stanislov "Mistakes" Danilov's Widowmaker. Boston looked to assert themselves on the last control point, but New York's defense clamped down behind Hae-seong "Libero" Kim's Genji, who wiped out most of the Uprising team with his Dragon Blade. The map ended in a draw. Sunday kicked off with the Boston Uprising in action against the Los Angeles Gladiators. This is the first of the Stage Finals to feature four teams, with top seed Boston selecting their opponent. The first shots were fired on Saturday, with team president Chris "Huk" Loranger saying on-stream, "We don't have a warmup for tomorrow, so we wanted an easy opponent. We're picking L.A. Gladiators." Boston was quick to back up those fighting words, crushing the Gladiators on Junkertown to start the series. 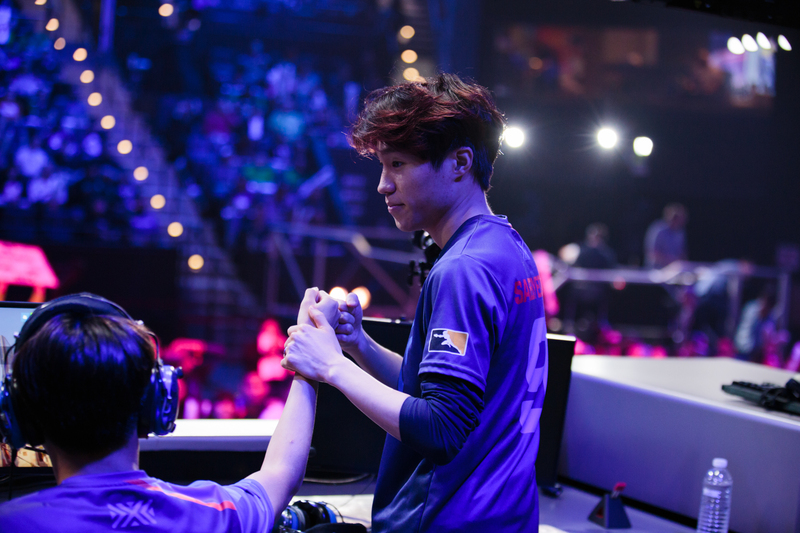 Joon-seong "Asher" Choi subbed in for João Pedro "Hydration" Goes Telles in hopes of giving the Gladiators some momentum, especially on an Ilios map that has typically given them trouble. While Asher's Tracer seemed game and Lane "Surefour" Roberts started to get into a groove as Widowmaker, there was just no stopping the Uprising, who rebounded from any minor inconveniences to take the map in commanding fashion. After halftime, the Uprising showed the Gladiators no mercy, wiping them out on Anubis. The second match saw the New York Excelsior take on the Los Angeles Valiant. The Excelsior similarly got off to a hot start, with Do-hyeon "Pine" Kim showing why he's one of the best Widowmakers in the world. The Valiant put up much more resistance on Ilios, but Libero's Pharah kept his team in it as they narrowly hung on to take the first point and eventually took the second point. Following the halftime break, the Excelsior clamped down on Anubis and played lights out defense, preventing the Valiant from even reaching the first point. New York proved just as dominant on offense, steamrolling the Valiant in mere minutes to take Anubis and sweep the series. For New York, they avenge a 3-2 loss to the Uprising back on April 12. While this is the Uprising's first loss since before Stage 3, their regular season win streak remains alive heading into Stage 4. Duh, they are owned by Robert Kraft. That's the M.O. of his teams: choke at the Big Game. But they are managed by HuK.